De Luxe Chrome Push Buttons feature a true Old School look and can fit on any custom Harley Davidson, custom chopper or bobber. 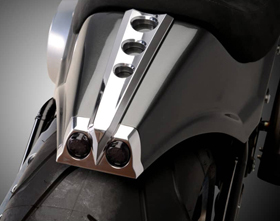 These motorcycle chrome push buttons are ideal for discreet operation of starting, horn, turn signals and hi/low beam (with our Motorcycle Switch Relay), while keeping your custom chopper looking clean, shiny, smooth and uncluttered. 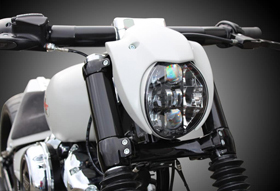 De Luxe Chrome Push Buttons perfectly match our De Luxe Retro Motorcycle Hand Controls All Aluminum and De Luxe Retro Cable Motorcycle Hand Controls All Aluminum. Screws included, requires drilling into your handlebars to mount. Sold individually.